I am massively allergic to cats. I can’t really be near them for long without getting a stuffed up nose, streaming eyes, and a dry throat. With that said, I’ve always found their relaxed nature, lack of worries (like taxes), and demand for attention to be something I strive for. You see, in video games, I can be whatever cat I want. Cats have been known for sitting in boxes, not caring about their owners, and knocking over objects that they don’t care about. After watching cats destroy your possessions for most of your life, in Calateral Damage, you can become the cat, knocking everything off of the shelves around you! Jumping to higher shelves, swiping all of your owners items, and adding more to the floor as fast as possible in order to get the highest score. As you use your little cat arms to push things to the floor, a bar will fill up, showing you how destroyed the room is! When it comes to destroying houses, cooped up house cats are surely the best. It’s really fun and very cathartic to destroy this entire house! Catlateral Damage is on PC, Steam VR, and PS4. Cat Quest is an open world RPG that’s full of cute, adorable, heroic cats. As a cat hero, in search of your sister who has been kidnapped, you must use your magic to explore the entirety of the world of Felingard, taking on any enemies that come your way. Exploring dungeons, defeating enemies, and gaining loot is what’s in store for this furry feline. You will be given a bunch of side quests to take on, experience real time combat, and seek out many, many puns. The world built around Cat Quest is extensive, with so many different individuals, all with their own personalities. It’s well worth taking the time to explore the towns and talk to the people that live within them. These humanistic cats take on great adventures, and you can too, in Cat Quest. The visual novel, Hustle Cat, has you playing the role of Avery Grey, an average, albeit slightly lazy, person who has found a simple job in a cat cafe. At first, everything seems pretty normal. It’s a job, Avery doesn’t mind cats, but the owner seems quite… strange. As it turns out, there is more than what meets the eye when it comes to this cafe. The owner seems to be using a curse to turn people within the cafe until cats! Each of the various workers you see are slowly becoming cats. Some don’t mind, while others really struggle and miss their human form. It’s up to you to get to know them and help them on their journey. You can even romance some of the individuals, if you’d like! Wholesome Cats is a very cute adventure RPG that sees you adopting cats, play-fighting other groups, and exploring a huge world. This island of kitties has tons of secrets to discover, many of which are full of kitties. As you play fight with other groups, you can attack or act at them, unless you want to flee. Your goal is to make the other cat tired, then you can either defeat them, or if you’re lucky, let them join you. With each battle comes some coins and fish, which can be used to adopt more cats or level up the cats you already have. There is a mysterious story around this game — but you’ll need to explore the island more to find out what’s going on and bring back peace to catkind. You can play Wholesome Cats in your browser on Armor Games. Neko Atsume: Kitty Collector by Hit-Point Co.,Ltd. 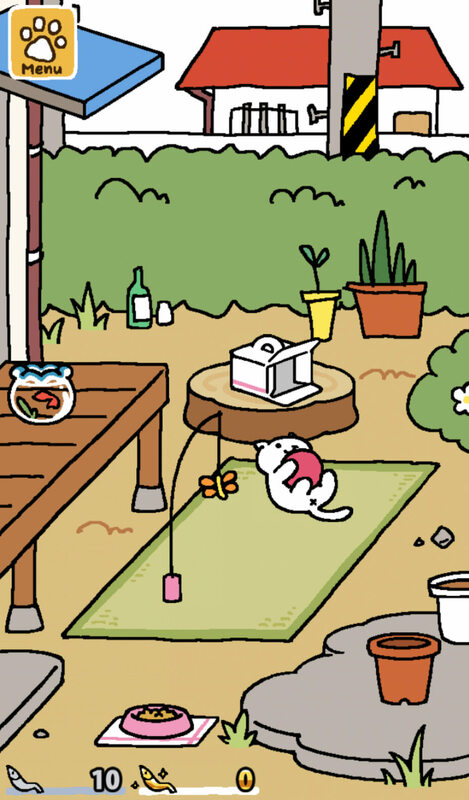 The iOS and Android game Neko Atsume: Kitty Collector allows you to collect cute cats that visit your home. Through placing toys, decorations, and different foods, you can lure cats into your home and yard. Once they are there, you can take pictures of the cats and get to know them! You’re able to keep track of your cats and the details you’ve learned about them in your notebook, allowing you to lure cats back if you now enough about what they love. You can leave your garden, turn the app off, and come back to it whenever you want to find more cats. It’s quite lovely to dip in and out of! You can find both mobile versions on their website. Another mobile game, Kleptocats has the cats getting items for you, instead of you purchasing items for them. The cats you are collecting have a keen eye for cool items. And they can’t stop themselves from grabbing whatever they get their paws on. These items do look cool in your house, so it’s not too bad as they don’t get caught. Kleptocats bring you cool items that you can then use to decorate your home, but sometimes they bring back much more dark items. Knives, notes asking for help, strange things that don’t fit into your home. You can stick around and discover more of the story, or just make your home nice. It’s up to you, and this another semi-idle game that sees you dipping in and out. You can find the game on their website. Super Cat Tales 2 is an adorable action platformer full of adventure. You play as Alex the cat, and their friends, who are taking on an army of tin soldiers. These monsters have invaded Cat Land and filled it with traps. Featuring a bunch of levels, boss battles and many secrets, Super Cat Tales 2 is a challenging platformer, but well worth the time. To take on the various traps and levels, you can equip your cats with weapons and items, in hopes of destroying the army around you. Hopefully, you can defeat them. You can find the game on the Google Play store. Night in the Woods is a lovely story based game that follows Mae, a cat who is visiting her hometown after dropping out of college. Things have changed in the time she has been away, but most things seem somewhat familiar. There’s a lot to do, friends to interact with, and even computer games to play, despite the small amount of days. Through the choices you make, you’ll develop relationships and learn about the other people of this town. As it turns out, even small towns contain big secrets, and you can figure out what a strange cult is doing inside yours. Through stressful dreams, heartwarming conversations, and fights with friends, Night in the Woods really showcases coming home to a small town full of mystery. The Cat and the Coup is an abstract platformer that sees you playing the only living creature that is going to see the coup through; a cat. You are the cat of Dr. Mohammed Mossadegh, the first democratically elected Prime Minister of Iran. Not everything is perfect when it comes to this election. In the summer of 1953, the CIA started a coup to bring down Dr. Mossadegh. As a cat, who cannot talk to humans, you must interact with your owner by knocking objects over, begging for his attention, scratching him — which will in turn bring significant memories back to him. Many of the people of Iran don’t know everything that is going on and you can’t exactly talk to them, so you must see what happens with this coup through a felines perspective. Choice of Cats is a massive text-based game that sees you playing an average cat who can go on huge adventures. This interactive novel doesn’t contain graphics or sound effects and instead focuses on the words presented before you. You play as a rescue cat who has been looking for a forever family, but found yourself in one that’s about to break apart. Desperate for a home, you can manipulate the people you interact with and other pets, just make the future one you are happy with. It’s up to you to decide if you want to love them, make them fear you, or just live your life near them. You can even become famous as a YouTube cat in this hilarious story. You can find Choice of the Cat on PC, iOS and Android. Disclaimer: Jupiter Hadley, one of the website owners, is an Adept Game Wizard for Armor Games. Wholesome Cats is a game which you can play on their website. This did not affect our ability or choice to cover the game in this list. You can read more information on our disclaimers here.